During a long conversation with Don Broggini (of Stardust Special and Flying Wing fame) he pondered the possibility of an R/C DT but then dismissed it as impractical for normal flight regimes. He was amazed how quickly I found a reference to it on line. In Radio Modeller Mar 1984, a diagram was published of an r/c operated dethermalizer to fit to to a fully flying stab replacing the usual horn. 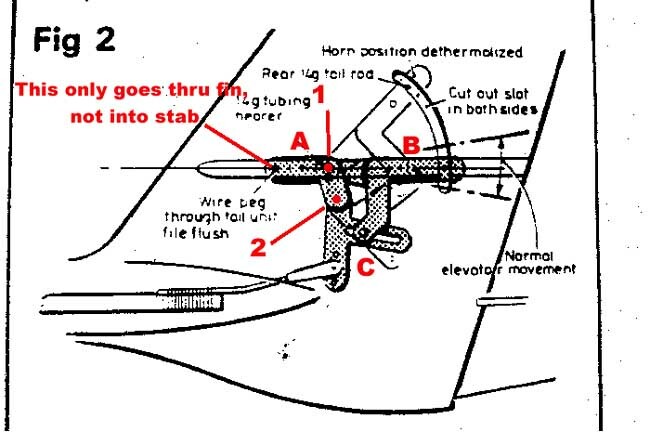 You fly normally, but if full up trim is selected, then full up stick applied, the stab went to 30-40 degrees up, causing a deep stall. The airplane then descended almost vertically, but horizontal, and fell more or less gently. Normal control could be recovered by reverting the stab to normal. I can not figure out how to make the linkages because the outlines are confusing. Has anyone made one? It could be done by using 2 servos, but this neat as it only used the one servo. I can email a pic if anyone can help. I want to try it as I want to fly in a clearing in the midst of trees, and this would be the way to "land"! You need 2 of part A. SInce this part is fixed to the fin, it could be integral to the fin, and doesn't need to be this exact shape. Part B has a tang that rides axle 1 between the 2 part A's. It also has 2 lower arms that engage the slot in part C. You could most easily make part B from sheet stock by using one "tang" piece and two "lower arm" pieces. Axle 1 is also the main axle/ carrythru for the stab. Part C rides on axle 2, which wasn't clearly shown on the original. The slot in C, engages the 2 arms from B with a pin. It's all just a mechanical way to provide extreme exponential. Thanks to the contributors at R/C Groups for providing this info.